To start, I want to say that I am sorry for not having updated for quite some time. I caught the flu and cannot say I was in a state to blog anything coherent. I hope you understand. Everyone probably has their own favorite anime studio for one reason or another. 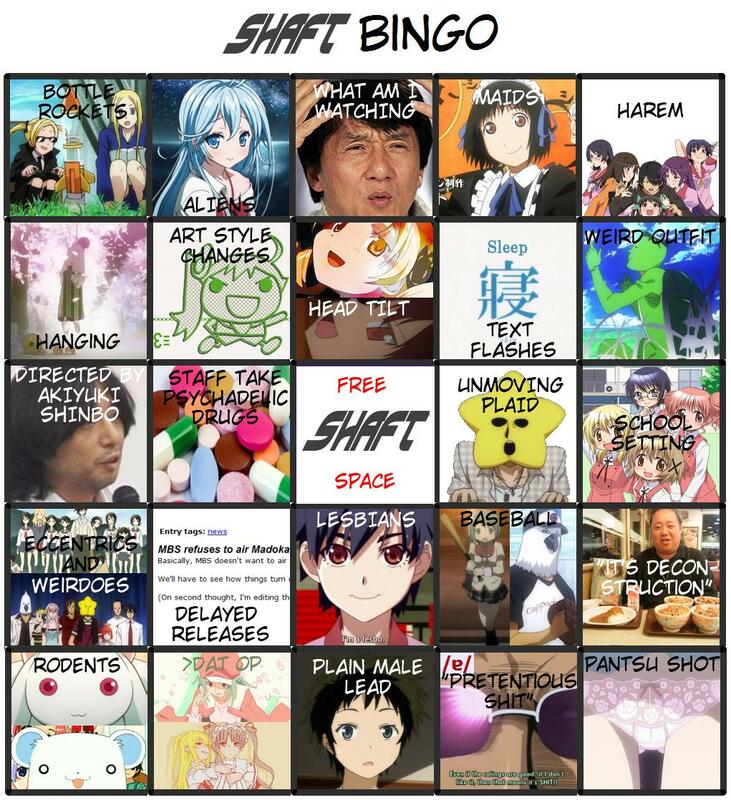 Mine is Shaft, the studio that is both hated and loved for their unique approach to directing anime (thanks to Akiyuki Shinbou). I will probably be accused of being an extremely shallow person for saying this, but this happens to be the very reason I love Shaft so much. Whenever I sit down and watch anything by them I never, ever, get bored. I may think something is bad or uninteresting, but thanks to their wonderful directing, it never gets boring! You never quite know what to expect when watching a series by Shaft, which I find very exciting for the lack of better words. The camera changes angle all the time, suddenly the art may change into something abstract or even feature real-life objects and so on. Endlessly talking mouths do not exist in anime created by Shaft (and the few instances they do exist, the camera often cuts to something else every now and then) which is a wonderful thing. 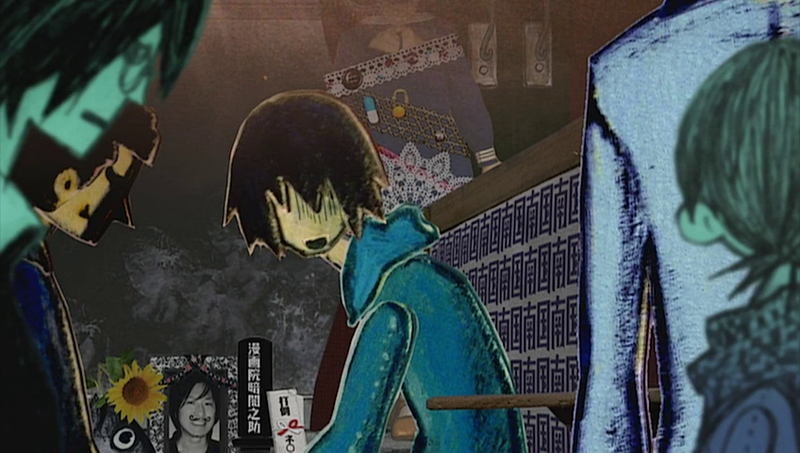 This is also why a wordy series such as Bakemonogatari actually worked: it never grew stale visually. Sadly, this very strength also has its downsides. Many find series by Shaft to be mere slideshows, which I find unfortunate. But they are correct: Shaft are not a powerhouse when it comes to actual animation. There are, seemingly random, times when they put a lot of effort into it, but it is not as common as in a series by, for example, Madhouse. Luckily, this does not matter in the slightest for me (but I can see why it does for others). In addition what is mentioned above there is also the fact that Shaft’s stylish visual approach can come across as pretentious or as “style over substance”. Personally, I am somewhat in the fence when it comes to this. You see, many times Shaft uses their trademark style… just because it is their trademark style. Look at basically any series created by them and you can see it used over and over again. Does their style actually make a series better or not? There are definitely cases where it does. Sayonara Zetsubou Sensei would have lost its quirky charm without the playful animation, Bakemonogatari simply would not have worked as well without it and Mahou Shoujo Madoka Magica vows the style into its storytelling in an excellent way. But what about when it comes to Arakawa Under the Bridge, Maria Holic, Hidamari Sketch and the likes? No-one can say for sure whether or not Shaft made those series better with their style. However… I do not care. Shaft enhanced my experience and made me enjoy them all. All thanks to their crazy directing. This entry was posted in Anime, Editorials and tagged Animation, Awesome anime director is awesome, Bakemonogatari, Bingo, Company, Favorite anime studio, Head Tilt, Hidamari Sketch, Industry, Madoka Magica, Sayonara Zetsubou Sensei, Shaft, Weird. We are living in the golden age of Shaft. 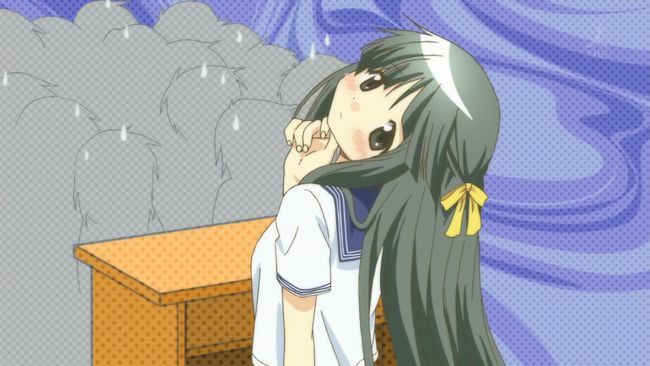 Odd camera angles, emphasis on dialogue, (MOSTLY) great manga chosen to green light or good original shows produced, creative and bizarre animation style (as far as I’m concerned), hit and miss rom-coms, introducing me to Aoi Yuuki, ending my allegiance with emptyblue for good. introducing me to the sexiest 2D woman in existence. These are all the things I thank to SHAFT for since blessing them with my eternal loyalty. I knew that one would confuse you. Don’t mind it. It’s not important. Really, the other ones I mentioned are the more important ones. SHAFT, rom-coms aside, makes great shows. How is Ef? If you’ve seen it, that is. I have both seasons of Ef in my Hard Drive and on my “eventually” list. You’d be surprised how long my “eventually” list is. As for Arakawa, good stuff. Mino in a bikini was hnnnng. I haven’t seen season 2 yet but if it’s only inferior to the previous season and nothing e;se, it should still be fun. Some of the “bad guys” who are meant to be funny by being rude were fine…except for “loli Hulk”. Yes, I wanted to knock her teeth down her throat. The second season is basically only comedy (not that fun either). So if you, like me, really loved the romance and story aspect of the series, you will probably be disappointed. Not sure about favourite studio, but definitely high on my list. In terms of actual show quality they’re extremely varied, but I’d certainly agree their style is the best in the industry. I remember when I first watched Bakemonogatari and it really struck me how varied and interesting animation could be. Unfortunately that led me, someone fairly new to anime, at the time, to think taking different styles was standard for the anime industry, and I’m still disappointed by the reality to this day. Can’t honestly understand why someone would rather watch many of the competent but bland studios’ animation over something dynamic and unique and, in my opinion, completely gorgeous. Nisemonogatari’s level of smuttiness has lost them a lot of browny points with me, but they had a lot to spare by that point. Pretty sure I’m unusual in this regard, but Arakawa’s actually probably my favourite work of theirs, still sits comfortably above Bakemonogatari and Madoka, for me, despite how much I love those shows. Can’t honestly understand why someone would rather watch many of the competent but bland studios’ animation over something dynamic and unique and, in my opinion, completely gorgeous. I ask myself the same question and cannot come up with a good answer. Perhaps because it’s so different from the rest (which makes people call it pretentious)? As you said, it’s disappointing that not many studios have trademark styles. Sure, some studios may have certain things (Gainax ending!) (Bones being deep! ), but it’s not really as outstanding as Shaft. Nisemonogatari’s level of smuttiness has lost them a lot of browny points with me, but they had a lot to spare by that point. Agreed to some degree. I didn’t like the “smuttiness” myself in Nisemonogatari and it became rather distracting in terms of telling a story. But at the same time, I have to give them credit for being able to create… “good” fanservice that makes me feel uncomfortable. That’s something, I guess? Pretty sure I’m unusual in this regard, but Arakawa’s actually probably my favourite work of theirs, still sits comfortably above Bakemonogatari and Madoka, for me, despite how much I love those shows. To me, Sayonara Zetsubou Sensei is the best, with Madoka a close second. Then comes Hidamari Sketch, Bake/Nekomonogatari and Arakawa. If you would only add “toothbrush” to that Shaft Bingo list..
Haha! It’s not mine. Toothbrushing has only been in one series too. Shaft’s animation style is pretty interesting. I’m not a fan of the slideshow moments, but I do love some of their other peculiarities like the head tilt and the way they make cute characters shine. Any particular reason you don’t like the slideshow moments? Personally I find then much better than the typical still shots we often have in anime. I will forever associate Shaft with Sayonara Zetsubou Sensei, but I think I’d have to place Madoka Magica as their best. I think the list would be something along those lines. Sasami-san will probably be around 8 when it’s finished. Got lots of Shaft series left to watch! I’m quite curious, actually! Shaft doing both Mekaku City Actors and Nisekoi at the same time sounds like a recipe for disaster considering their, at least previously, usually messy schedule. As for the series itself I guess they’ll just adapt the manga? Who would agree if I say that SHAFT is completely SH@T? It’s true that their shows are unique that’s why more and more people hate SHAFT. I’m just explaining why I’m right here because when you really understand the way SHAFT made anime, it’s completely a waste of time one of the reason why because their works made your eyes hurt. I hope they change the way they work so that they will not be hated. I’m not sure I fully understand what you, especially regarding the waste of time. I should also note that Shaft got some huge sellers in terms of Madoka Magica and Monogatari (some of the best in the industry). SHAFT is not really a good studio. It’s really a waste of time in some people because their animation is not meant for international, and their RED Frames, Black Frames, etc. is very annoying they are not good as other studio.. what I mean is that the anime that shaft made is more on Japanese base or what we call it LOCAL. For some People, mostly in Western Countries they really don’t like the SHAFT studio. I would like to advice shaft studio to at least make their animation better, It’s OK be unique but not the way they made some annoying frame shot and other annoying animation. Why is it not okay?